Sometimes I feel bad for the fathers of the world. In a million ways we cut them down and act like they aren't necessary or needed or an important part of the equation. How horrified would I be (and frequently am) if the world and all those around me treated the sacred blessing of motherhood as though it was useless, replaceable, and not really necessary. I love being a mother. It is the greatest blessing and the biggest challenge of my life. Mothering isn't the only work I plan on doing in my life, but it certainly will be the most important. And fatherhood is no different. It is as derided as motherhood, maybe even more so. There are countless media representations of dads as the doofus, the jerk, the abuser, the idiot, the replaceable, unnecessary sidekick to the rest of the family. Over and over in the media (for some reason particularly when it comes to journalist Hannah Rosin) I read articles talking about how we are approaching the "end of men" and they are on their way out. Nothing could be further than the truth. Good fathers are more needed now than ever before. They have always been necessary and always will be. A good father is a blessing to his children just as a mother is to hers. I am grateful to have been blessed in my life with a good dad. He always tried to do his duty as a father and husband. He has always been good to my mother. He always provided for us temporally. He was a good example of a lot of things and it has been a blessing in my life. Today I am grateful for my husband too. He tries to be a good father and he loves his children. He seeks to provide for them the best he can and he tries to guide and lead them. He tries to live his beliefs and live with integrity. He sticks around when it would be easier to walk away and he does the hard things that dads sometimes have to do in order to be dads. He doesn't drink or waste his time or money trying to distract himself from his life. He is in it for the long haul. I see dozens of men go through my natural birth classes who are genuinely good men. It is a blessing and a pleasure to watch them prepare each week with the woman they love to help bring a baby into the world in the best way possible for them. There is nothing sweeter (or possibly more important) than the simple DESIRE these men have to just do a good job. I feel so lucky that I get to watch them strive for awesomeness in their lives. It literally makes me happy. I think that the plight of fathers in our society is somewhat akin to the typical plight of the typical unprepared dad in the delivery room. 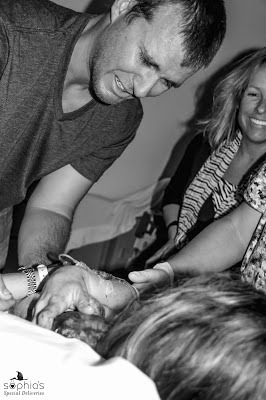 Everybody has incredibly high expectations for the dad when mom goes into labor. We expect him to say the right thing, do the right thing, touch her in the right way, know what is going on, and be basically the perfect massage therapist and mind reader. And then we give him zero tools and big giant heap of fear to help him get that impossible job done. Finally, when he crashes and burns, we get kind of mad that he didn't do a better job. I wish there was a little more support and love out there for the good men and the great fathers of the world. Few of them are reading this post, but if you happen to know one of these guys, tell him you noticed. Tell him you are grateful. Tell him you appreciate that he tries to be good and tries to be a father when there is literally no praise, no popularity, and no party in it for him. Instead he will probably have to give up a few things, set aside some loves, and sacrifice it all for some sleepless nights and a frequently empty bank account and smelly car. Thank you to the dads of the world who make an effort, who try harder, and who are fathers even when it isn't easy. You are making a difference.